Map Stop | Top maps at a reasonable price in one place. Welcome to MapStop Global Mapping’s easy to Use Online Map Shop – Top maps at a reasonable price, we select all our products carefully to make sure you will have the best possible choice and be assured all products are covered by our guarantee. If you need any help or advice you can chat with us in real time in the chat box to the left or you’re more than welcome to call us on 07957 806497 and one of our friendly staff will answer-we don’t have impersonal automated call systems, just humans! What will Europe look like from April 2019? The UK is leaving the European Union and this unique Post-Brexit European Union Political wall map shows political colouring highlighting the EU member states after April 2019. 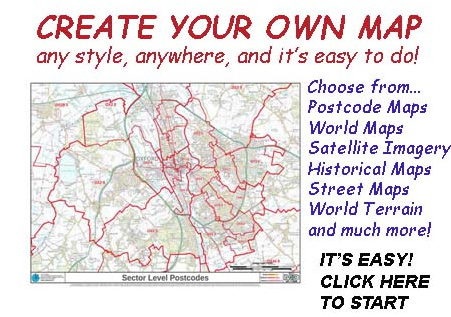 You can make your own maps on demand now, centre it on your location and decide how far you want to cover, show every street if needed, choose how detailed the Postcode Boundaries should be, select from Postcode Areas (NN) Postcode Districts (NN13) or Postcode Sectors (NN13 5) or none at all! You also have the option to create maps of anywhere in the World. It’s easy to use so to start creating your own map click here. Stargazing has become one of the most popular pastimes thanks in part to the excellent BBC 2 programme ‘Stargazing Live’. Professor Brian Cox has made the stars popular, so much so that Global Mapping’s Planisphere sold out within months. 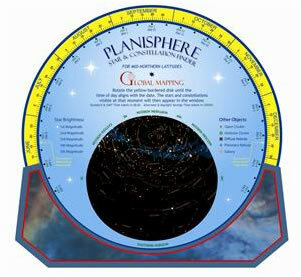 Global Mapping’s unique Planisphere features a unique double sided disc which allows the novice stargazer to start navigating the sky at night. Accompanying the Planisphere is the Chart of the Night Sky, a beginners guide to stargazing, complete with clear charts and all the background information you need to start stargazing and identifying planets. There are plenty of other Stargazing products to view, just go to the Astronomy Section. Globes are one of the most fascinating products devised as they provide a true life representation of the world we live in. As an educational product, a globe can bring to life the true concept of living on a sphere, Children in particular are fascinated by the concept of the globe and it is for this reason we stock educational globes as well as those aimed at the adult market. You will find here a fantastic and wide selection of Globes, from Inflatable Globes and ‘Huggables’, suitable for small children through to our collection of junior and family globes. MapStop also stocks a wide selection suitable for many other uses whatever your requirement. And, if you are thinking about a decorative and wonderfully crafted globe to take pride of place in your home or office then look no further than our wide selection of antique and modern table and floor standing globes, many of which are illuminated and have beautiful finishes, most come compete with decorative stands. With our large range and superb service we can help you purchase the globe that will provide you and your family with many years of pleasure. So why not take a look now at the fantastic products we have available and enhance your world now! Postcode Maps Area, Sector and District maps all contain a detailed map background for your reference. All maps have an optional laminated finish. Postcode Data Postcode Data PAF and Post Locator datasets of the UK, Full address and coordinate information for all postcodes. Ordnance Survey Data 25K, 50K and 250K Raster, Boundary-Line, Meridian, StreetView, Address-Point, Code-Point etc Ready for Internet use, in books or your GIS. Ordnance Survey Mapping and Data Centre Large scale mapping site centered on a particular location, either as digital data or a paper plot. Ideal for the land and property professional and for property planning applications. 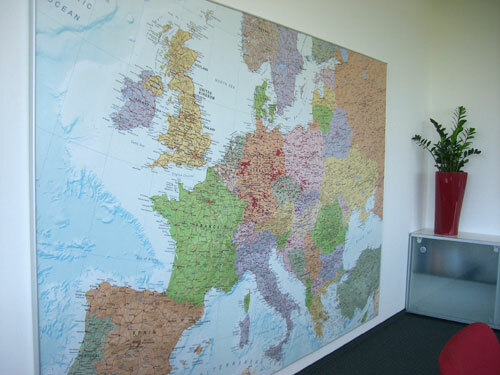 Promotional Maps and Atlases for the useful corporate gift that won’t get thrown away! Mapping Software including leading GIS MapInfo and MAPublisher which allows you to take your GIS data into a graphics environment to produce high quality printed maps. 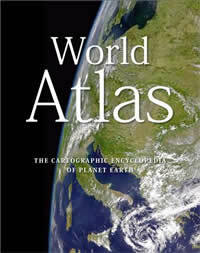 Award winning Atlases are our stock in trade, we offer the range of EARTH atlases including the limited edition EARTH and the World Atlas (pictured) which is being offered for just £45 with a donation going to the Cystic Fibrosis Trust for every copy sold. Look out for EARTH PLATINUM, at 6 feet high, without doubt the largest World Atlas ever published! Add the Times Comprehensive Atlas to these and you can see why you will only find the very best atlases on MapStop. But it doesn’t stop there, we have a selection from National Geographic, beautiful images in the Earth From Above-Collector’s Edition plus many more for you to choose from in the World Atlas section. OS Explorer / OS Landranger Highly detailed maps for walkers / the purple covered general purpose map. Aerial Photographs SkyView Posters offer over 100 aerial views of various towns and cities plus historic aerial photographs from WWII. If you love messing about in boats then visit our Sailing section where you will find a wide range of books, guides, charts and posters covering all aspects from yachting to canal boats. 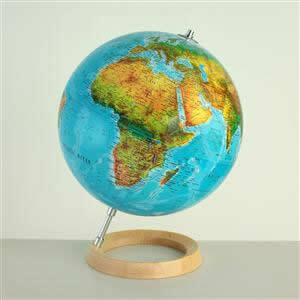 World Maps a comprehensive range of World Maps at a choice of scales for use in the classroom, boardroom or home. British Isles Political and Physical maps of the British Isles at a choice of sizes. 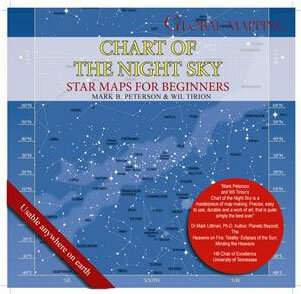 Star Maps Your MapStop Star Chart will help you identify the Sky at Night. Historical Ordnance Survey Maps will help you understand how your town or village has developed over the years. There are also aerial photographs taken on June 6th 1944 over the beaches of Northern France. You can become a part of this exciting website by signing up as an affiliate. It is FREE to sign up and you get 10% commission on every sale you direct to us from your website. Just click here and follow the simple instructions.